Traditional worship is linear - it starts at the beginning and follows a structured service through to the end. Liquid Worship is different; instead of being linear, there are stations or zones set up around the church for people to visit. The congregation can choose how they spend their time - for example they can spend all their time at one or two stations or visit all of the stations in any order they please. 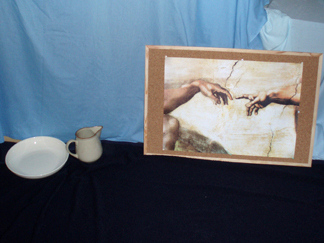 The stations may include reflecting on readings, listening to music, taking part in actions, or art and craft activities. Liquid Worship can work well with different age groups with material provided at many different levels. This was our church's first attempt at Liquid Worship. We began with our usual Palm Sunday procession up the High Street. When we reached the church we explained the idea of Liquid Worship and that people were free to visit stations as they pleased. We came together again at the end for prayer, a song and for distributing the palm crosses. We had six stations based on traditional elements of worship: confession, statement of belief, prayer, word (including Bible readings) and reflection. At each station there was a selection of readings, pictures and activities. The focus for this station was the picture of God's hand reaching out to man, painted by Michaelangelo in the Sistine Chapel. 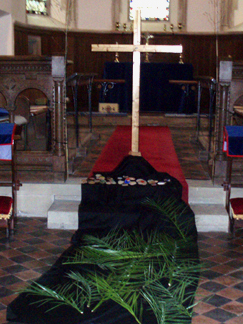 We put down a length of black material with a bowl and towel and invited people to lay down their palm branches while saying or reflecting on words of confession. 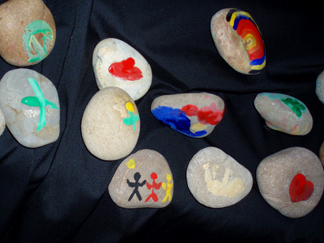 People were asked to paint or write their prayers on stones, which were placed in a cairn at the foot of the cross. We used the screen for a display of Bible readings, poems and prayers. 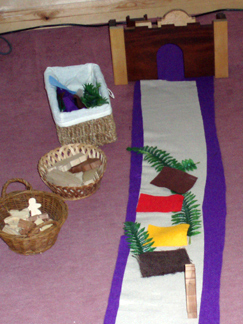 For children we had the model of Jerusalem with a felt road leading to it, the figures of the People of God, and the figure of Jesus riding a donkey (from Young Children and Worship). We also had felt "cloaks" and small plastic "palms" for the children to lay out on the road. Creed: What kind of king? This display focussed on the contrast between the traditional understanding of kingship (armies, riches, thrones) and Jesus' ideas about the kingdom of heaven - the sower, the pearl, the mustard seed and the child. 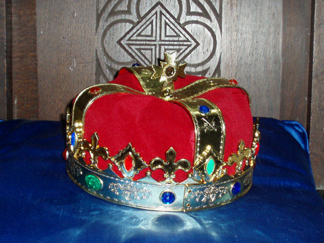 A king's crown was placed beside the crown of thorns. The children (and some of the adults) made crowns decorated with Christian symbols and pictures. We had two stations for reflection - one involved the donkey! We included poems and reflections about the donkey's role, including "The donkey" by G K Chesterton. The other station asked us to reflect on "Who is this Jesus?" - Troublemaker, Friend, Healer or Messiah? 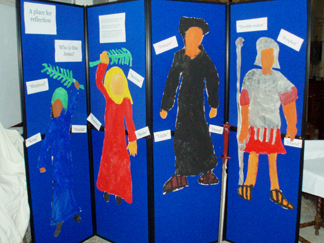 Our junior church and pre-school service had painted a variety of different figures. Some were waving palms, but there were also a priest and a Roman soldier to show that everyone has a different idea of Jesus. People were asked to take a small cut out figure and write on it the words that meant most to them. The liquid worship worked very well for all the children under 11, their families and most of the adults. The teenagers had a quick look round and then sat and chatted. Some of the older members of the congregation also found it difficult, as they were accustomed only to a word based service. We encouraged them to go to the word station and read some of the poems. One lady came away asking for copies! What would we have changed? We felt in future we would like to make things more accessible to people used to a more formal liturgy. We realised that it was important not just to have words on screens but also copies for people to pick up and read themselves. We also thought it would have been a good idea to have had music or poetry for people to listen to if they did not want to visit the stations. We would have liked to have found a better way to engage the teenagers, possibly by using audio visuals.